Pentaho Data Integration (also known as Kettle) is one of the leading open source integration solutions. With PDI/Kettle, you can take data from a multitude of sources, transform the data in a particular way, and load the data into just as many target systems. 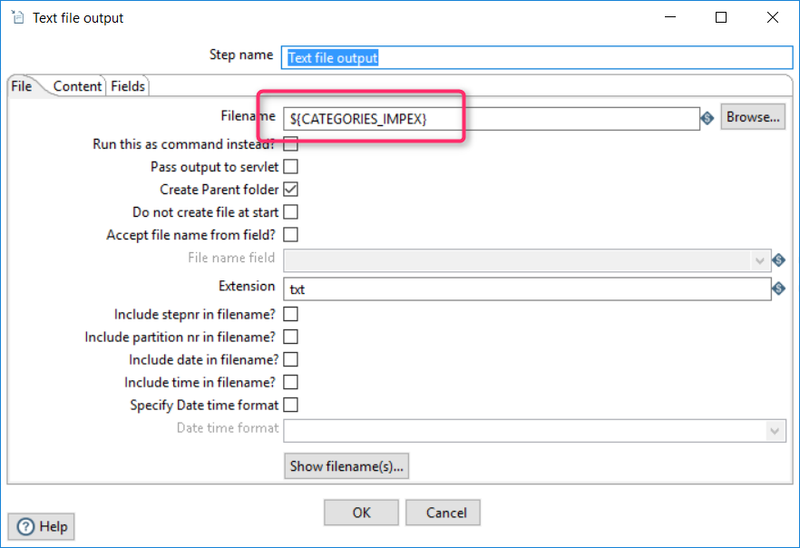 For this tutorial, I would like to demonstrate how to convert an XML file containing category data into Category Impex file using Pentaho Data Integration. To illustrate more capabilities and features of Pentaho, I decided to go with the comprehensive XML structure provides the data in a Entity-Attribute-Values (EAVs) model. Please note that category IDs begin with “H_”. 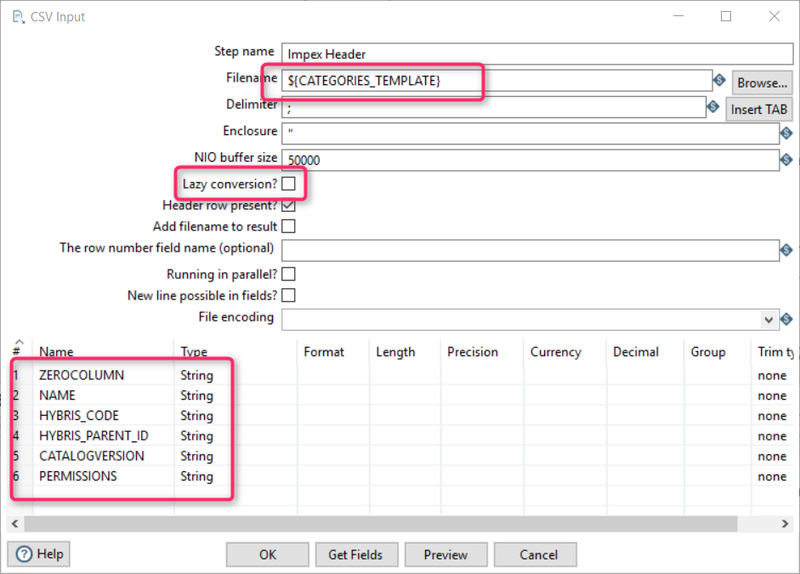 It is an optional change, just to demonstrate the Pentaho capabilities of Value Mappers. In the real projects, converting of IDs is also important, but the algorithm may be more complex. Root nodes are represented by empty values in XML. In the target format we will need to put them under one root node (let’s call it H_ROOT). So our goal is to transform original XML to this ImpEx file. In the previous article I showed how it can be implemented without using any out-of-the-shelf software. Today I am going to tell you about the alternate solution. This solution is a configuration for Pentaho, a data integration platform. Read definitions from XML. Reads column names and their codes. Read values from XML. Reads column values. This part of XML doesn’t contain the column names, only their IDs. So next phase is joining them together. Join Rows. 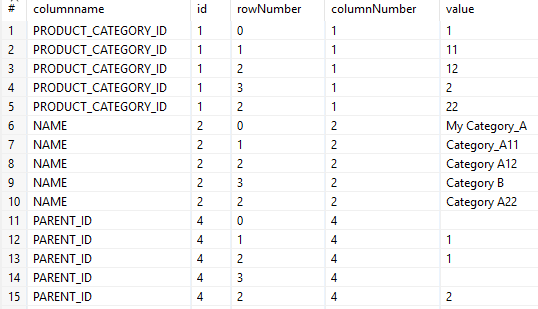 Two previous datasets were joined on id=columnNumber. Sort rows. Sorts by rowNumber. Denormalize. 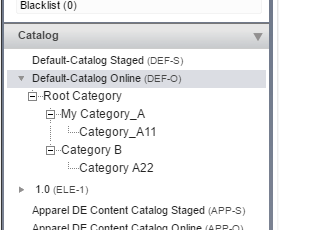 Pentaho creates additional columns (PARENT_ID, PRODUCT_CATEGORY_ID, NAME) using the values of the field “value”. Converting IDs into hybris IDs. According to the task, we add “H_” to the original ID. Converting root nodes to H_ROOT. Convert these data into CSV file. 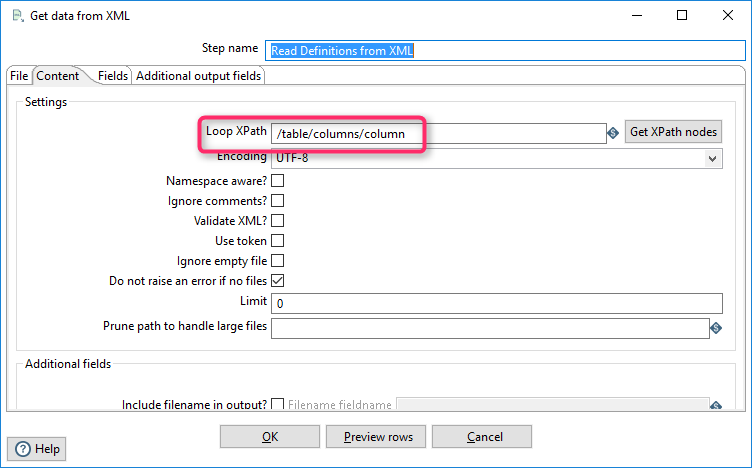 This step provides the ability to read data from any type of XML file using XPath specifications. It uses DOM parsers that need in memory processing and even the purging of parts of the file is not sufficient when these parts are very big. 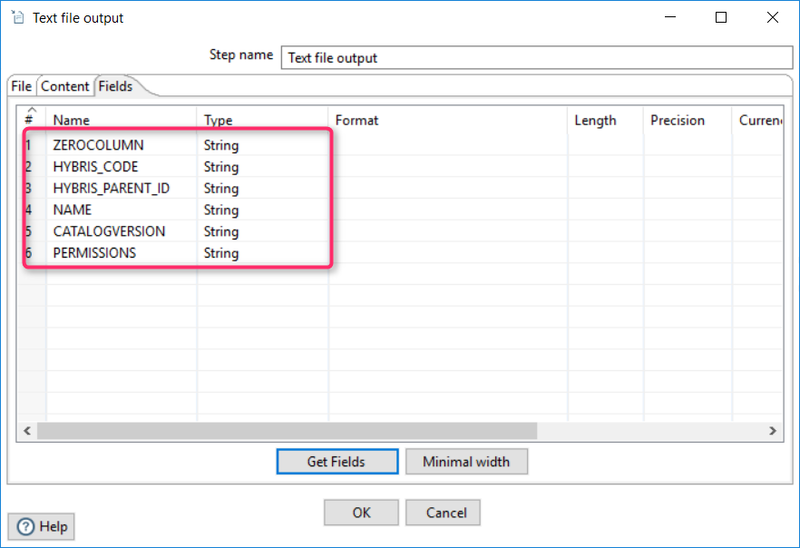 If you need to process huge files, Pentaho has another XML parsing component, XML Input Stream (StAX). File. The filename is stored as a project parameter, so I referenced to the variable by its name instead of using the filename directly. XML1 is a constant that is defined in the project configuration. You can also use a filename instead of the variable reference. Content. The “Loop XPath” defines a root node for the processing. This job processes the headers, so I filter the header section (see XML above). Fields. 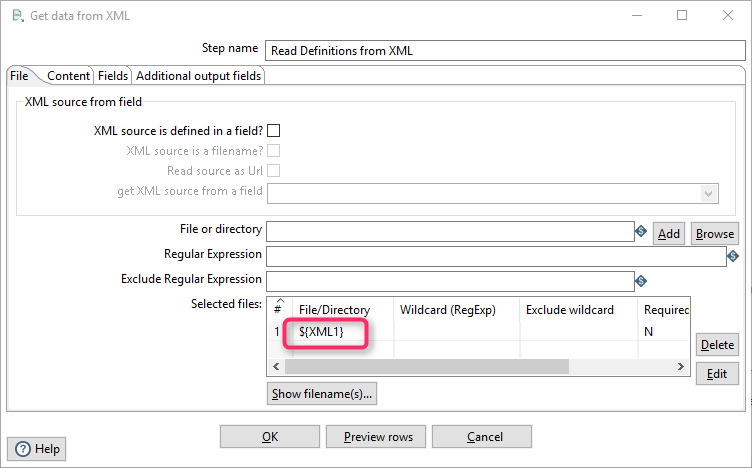 This section defines what XML tag/attribute values should be mapped with what fields. 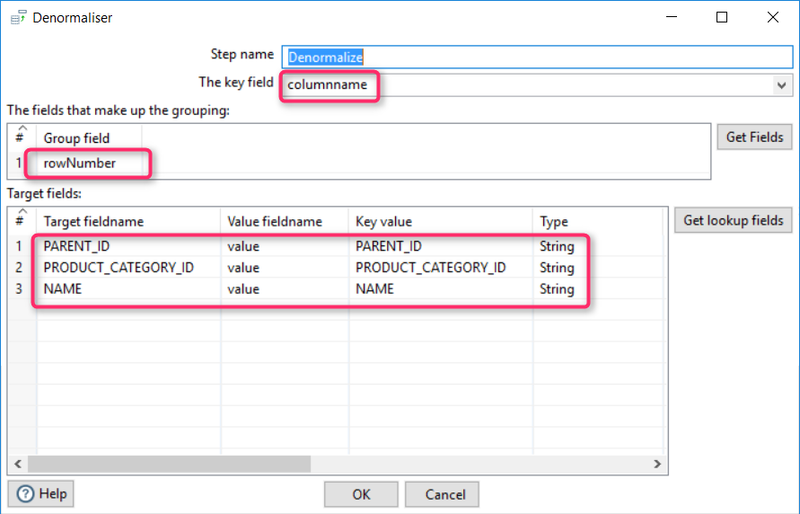 The rules below say: put a value from name tag into a first column (called “columnname”) and a value of the attribute into the variable “id”. For some categories, there is no parent category, so the values of the attribute #4 (PARENT_ID) are empty for them. For this task, the component “Joins/Join Rows (cartesian product)” was used.
. Both fields mean the same thing, a field name id. 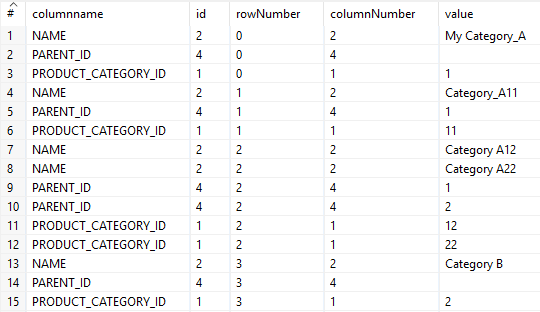 To get prepared to the Denormalization, we need to sort rows by rowNumber, that put the the same category related attributes together. This component converts EAV data into the fields, one per EAV attribute. Key field, the field from the source table that contains a name of the attribute. According to the task, we add “H_” to the original ID. I used a component called “Transform/Replace in String” and regular expressions. Two new fields are created, HYBRIS_CODE and HYBRIS_PARENT_ID. Some fields are no longer used and should be removed from the output. I used a component “Select/Rename values” for this task. 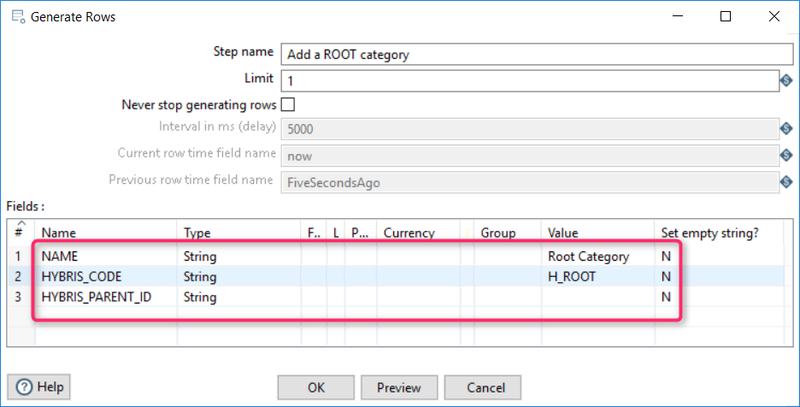 According to the task statement, we need to add a virtual category, ROOT, and move all categories under ROOT in the tree. I used the component “Input/Generate Rows”. 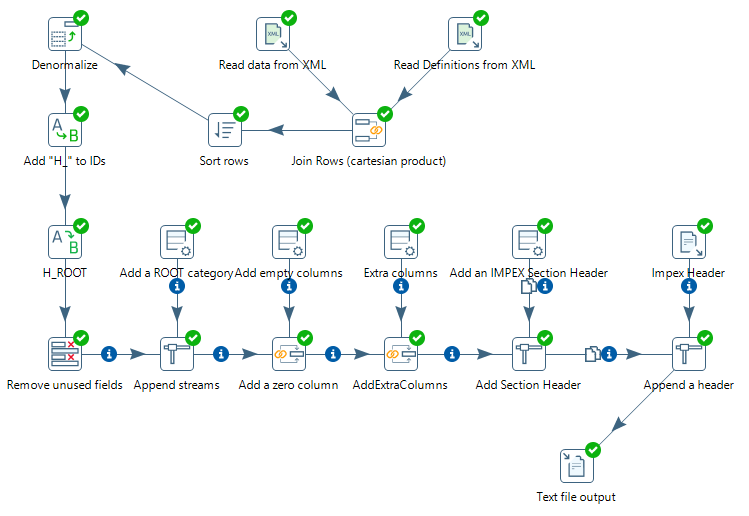 To merge it into the original dataset, the Pentaho component “Flow/Append streams” is used. 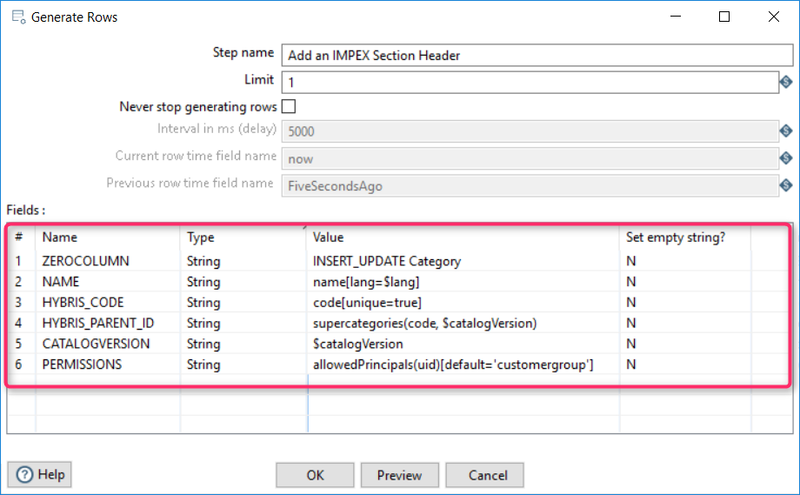 In the resulting ImpEx file, all data starts from the second column. The first column is used for the commands and ImpEx variables. “Input/Generate rows” is also leveraged. The same exercise is for CATALOGVERSION and PERMISSION columns. The only difference between this step and the previous one is a position of the couple in the resulting dataset. We are going to add it at the end. “Input/Generate rows” again. 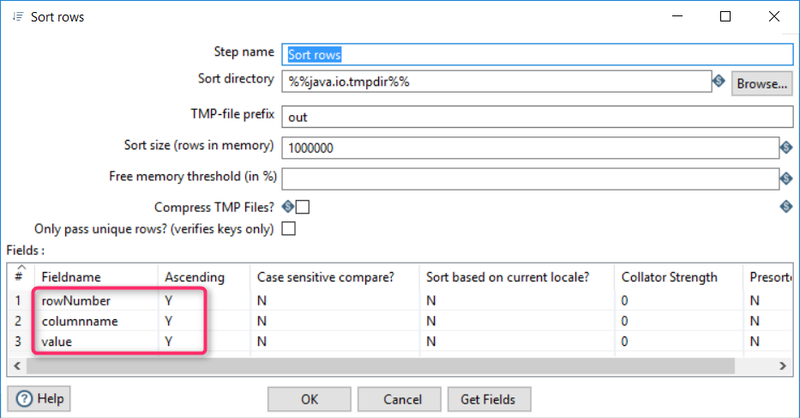 Similarly to adding a ROOT category, we create an Impex Section Header using “Import/Generate rows”. To avoid repeating the steps for each new line in the impex, I used a component called “Input/CSV Input” to get the template from the disk. The template contains variable definitions and constants. I use the global variable “CATEGORIES_TEMPLATE”. It is important, the Lazy conversion must be off. The last step is exporting the dataset into the CSV file. 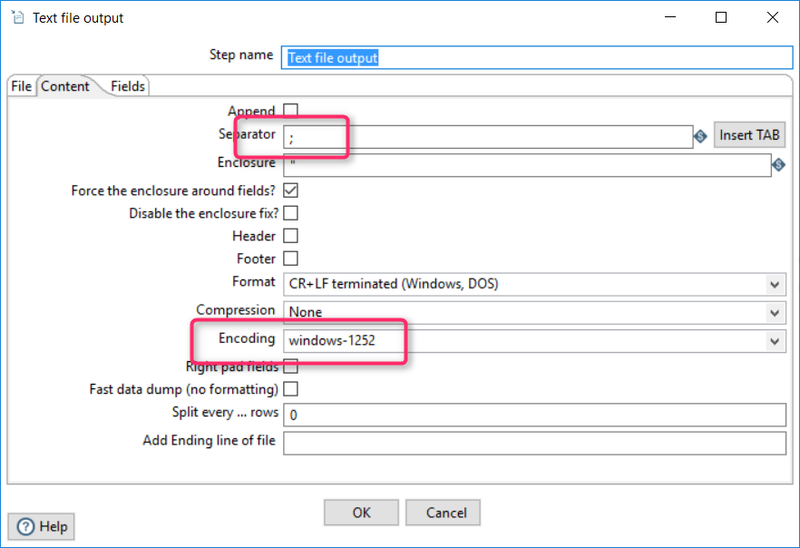 The component “Output/Text file output” is used here.
) that allows you to execute transformations from a terminal window. I’ve used Kettle for similar purposes in my ATG days to convert data in excel sheet to RQL for promotions, sale etc… for bulk update.